My grandfather, James W Wood was born in 1892. He enlisted into the Northern Cyclist Battalion in November / December 1914, trained at Alnwick camp, based at Bamburgh in Northumberland. Battalion relocated to Lincolnshire in April 1915. Transferred into the Somerset Light Infantry at some stage in 1916 (date unknown) with service number of 204497. Wounded in France and at some stage transferred into the Labour Corps with the service number of 572877. He married at Whaplode, Lincolnshire in November 1917, his marriage certificate shows his address as Seven Oaks, Kent. I am puzzled by the cap badge he is displaying on his wedding photograph (attached) as I don't recognise it as that of the Labour Corps. Any thoughts people?? Also, as his service record was burnt during WW2, is there any way of finding out the dates when he joined the SLI and the Labour Corps by using his service numbers? I agree with Michelle noting the shoulder title matches. And I don't think this can be his wedding photo, as it must been taken before he was transferred to the SLI. I believe that you are all correct in saying that the cap badge and shoulder badge are for the Cyclist Corps. Chris, I think that you are correct in that the photo is not of his wedding in November 1917 even though I was always led to believe that it was. His medals are inscribed with his SLI service number, his medal card shows both SLI and Labour Corps numbers. I have found a Richard Arnold that transferred in the SLI on 14 November 1916 and his service number was 204385, very close to my grandfathers (204477). Is it safe to assume that service numbers are issued in order? The lady appears to be wearing a wedding band. What was his occupation when he married Mahala Hunter on 10th Nov, 1917. Does the cert.list his service number or just soldier....looking for info. I agree that the cap badge is Cyclist Battalion but I do not think it is of the Northern Cyclists whose cap badge is discussed here. My grandfather, James W Wood was - Wounded in France and at some stage transferred into the Labour Corps with the service number of 572877. - is there any way of finding out the dates when he joined the Labour Corps by using his service numbers? according to the book "No Labour, No Battle", Starling and Lee, his Labour Corps No. was issued between May - September 1918. Barry - My grandparents marriage certificate shows that James was a soldier (no service number) with his abode being Seven Oaks, Kent. I am very proud of my great uncle Benjamin, I have built up a comprehensive story of his WW1 actions. He won the MM when he was first driver / engineer of his Mark 4 male tank, F31. As you know, most Mark 4s were given names and F31 was given 'Fearnought' which was taken as the motto of the Royal tank Corps in 1923. He won the bar to his MM for actions when he commanded a Whippet. David - The badge in question isn't a Northern Cyclist Battalion badge, they are similar but the NCB badge does not have a name scroll on the bottom. GWF1967 - many thanks for giving a time period of the issue of the Labour Corps service number. Is that a good conduct chevron on his lower right arm ? If so the picture has to have been taken after at least 2 years of service. It would suggest it was taken just before his transfer. I don't understand your comment on the badge in question. I know the Northern Cyclist badge is different from the one in the photograph! You say your grandfather served in the Northern Cyclist Battalion and then moved to the Somerset Light Infantry (SLI) but the photograph you have shows a Cyclist Corps badge. Did he perhaps transfer from the Northern Cyclist Battalion to another Cyclist Battalion prior to moving to the SLI? Joseph Sherwin Bates (204515) transferred to the Somerset Light Infantry on 31 October 1917 which puts his transfer closer to the time of his wedding. 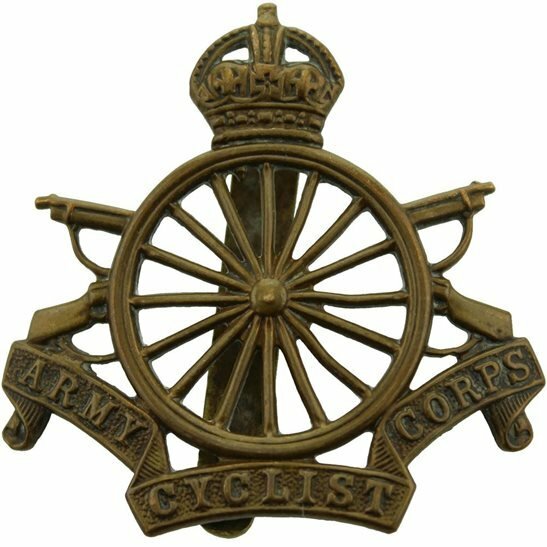 David - I have always understood that the Northern Cyclist Battalion (and all other cyclist battalions) came under the 'umbrella' of the Army Cyclist Corps (formed sometime in 1915). I know that my grandfather joined the NCB in December 1914 and was still with C Company of the 2/1st NCB when they were in Chapel St Leonards (Lincolnshire) and was still with them when C Company relocated near to Boston (Lincs) in May 1916. It may be that at some stage they were issued with insignia of the Army Cyclist Corps hence what we see in the photograph. My grandfather kept his cap badges of the NCB and of the SLI as well as his medals (I have these). 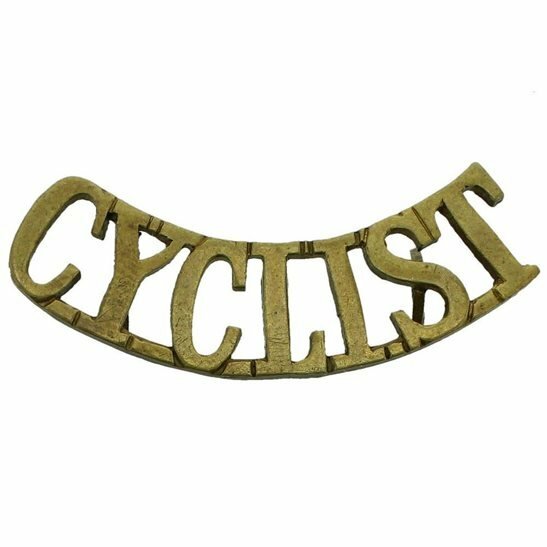 There wasn't a cap badge for the Army Cyclist Corps amongst his possessions when he died. Craig - thank you for pointing out the chevron on his left sleeve. I have just read up on good conduct chevrons and find that they had to be worn on the lower left arm sleeve with the point upwards - this fits with the photograph. As you say, one chevron would have been awarded after two years and as he enlisted in December 1914, the award of the chevron would indicate a date of no earlier than December 1916. I understand (from family lore) but can not prove, that James and Mahala became engaged at the Christmas time of 1916. 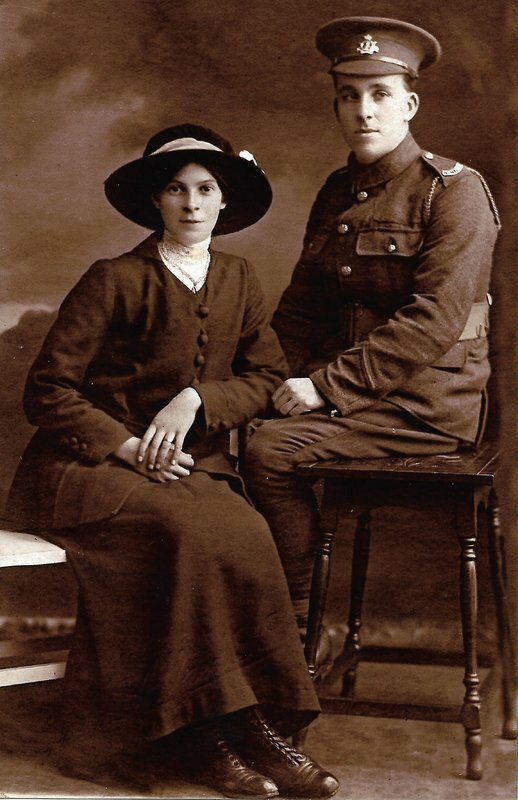 If I accept the date of their engagement, it could indicate that the photo was taken in the early part of 1917. (I know that C Company of the NCB was still in Lincolnshire in 1917). I may never be able to come up with a date of his transfer to the SLI but it would seem that it was sometime in 1917.